Our June sponsor is Desjardins. 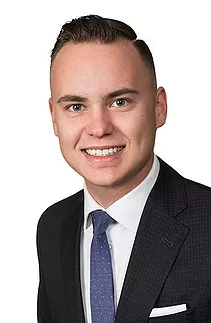 As a finalist for Canadian Real Estate Wealth’s 2017 Young Gun of the Year and nominee of the 2018 Saskatchewan Young Entrepreneur of the Year, Tyler Hassman is no stranger to real estate and entrepreneurship, even if he’s 21 years old. His drive and entrepreneurship have given Tyler the tools he needs to succeed in real estate and breakout in an industry heavily influenced by older age groups. A young entrepreneur from Regina, Saskatchewan, Tyler is the Co-Founder and President of M&H Real Estate Investments, which has a current portfolio of multi-family apartment buildings worth over $12 Million. Despite being what many would label as ‘young’, Tyler sees his age as a distinct advantage through his knowledge and use of innovative digital platforms and social media. From working on new deals, to bringing on new clients, Tyler also focuses heavily on influencing and creating a community for young entrepreneurs online, inspiring those around him to take action in real estate. Now, Tyler is coming to Ottawa to inspire you to take action.